I ordered talk talk broadband contract £20 over 24 months on 16/10/18. The talk talk connection went live on 30/10/18. The broadband was not working at all for hours and so I decided to cancel the contract on 30/10/18 as I was within the 20 days cooling off period. The customer service representative said she will escalate the situation and confirmed no cancellation fees as I was Within cooling off period. I phoned talk talk on 5/11/18 and spoke to the customer service manager Rodney who said no cancellation fee and all charges will be waived. He said account will be closed on 11/11/18. 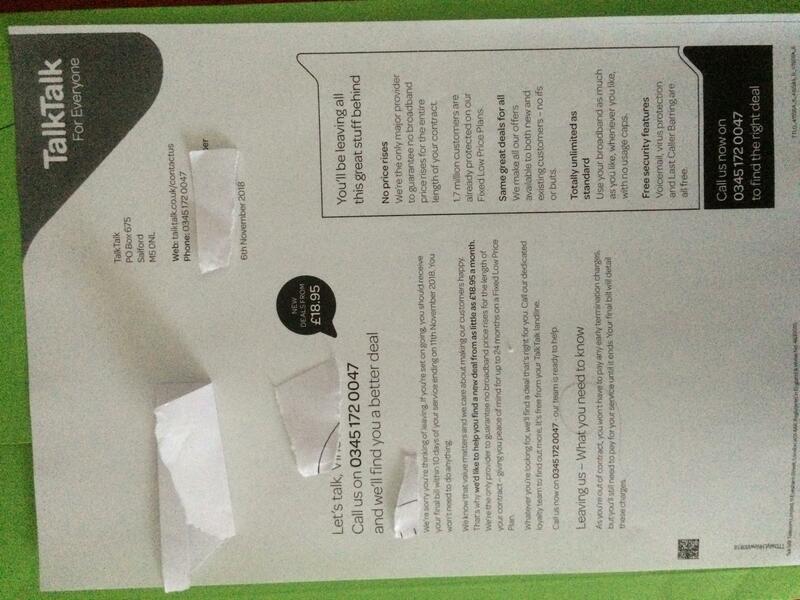 I received letter from talk talk customer service confirming account termination on 11/11/18 also received Jiffy bag for talk talk router return. On 7/11/18 I received email thanking for sticking with talk talk and my account will not be terminated. I received email late in the evening and was unable to contact talk talk until 8.00 next morning. I had very stressful night as I was worried talk talk will not close my account. I phoned talk talk at 8:00 in the morning and the customer rep said I was under contract for 24 months. I said I cancelled on 30/10/18 and gave Rodney ref number. Mistake by the back room staff and she said the cancellation will now be on 13/11/18. I received email confirming this. My first bill of £20.93 is due on 12/11/18. Rodney told me I don't have to pay this as it will be waived. Do I pay this first bill of £20.93 in order to get account terminated? Have you been using the service at all? No. The broadband never worked at all. I never used the phone as I don't have phone only mobile. no pay nothing you owe nowt. Thanks for your reply. I agree I have not used broadband as it never worked or used phone line. Thanks I'll cancel it now. Ask them to confirm in writing that the account was terminated within the cooling off period and that you will not be charged. I received letter confirming account will be closed on 11/11/18 and no cancellation fees. I will be charged for any service used. I also received Jiffy bag to return talk talk equipment with Royal Mail tracked. I also sent letter to the customer service centre in Salford by rmsp. Talk talk sneakily sent me email yesterday evening thanking me for staying with them and will not be closing account. I phoned them and told them I want to close account and the rep said she will close on 13/11/18. I'm worried talk talk will trash my credit score. I'm worried as talk talk don't want to cancel my account. They were supposed to cancel on 11/11/18. But they said error by back room staff so they going to cancel on 13/11/18. I had 2 letters for 11/11/18 cancellation and 1 letter for 13/11/18. What are my options if they keep cancelling my account cancellation. Talk talk failed to close my account on 11/11/18 and wants to keep my account open even though I have letter from them confirming account closing on 11/11/18 and no cancellation fee. I have send their equipment back and not used any of there service. How can I get them to terminate my broadband connection and close my account. For obvious reasons they want to keep account open and charge £20 for next 24 months. I have cancelled dd and have not used broadband as it never worked. This is causing stress and sleepless nights. [sorry that's best for you pic I can send on my mobile. Threads merged...please do not start new threads on the same issue. As of yet they not cancelled my account. I received phone call around 5 pm yesterday confirming account to be closed today. They failed to close on 11/11/18 and what if they fail today? I live in upstairs flat and there are others downstairs and there is a phone socket in the hallway leading upstairs. Who will be liable for costs after today if talk talk fail to disconnect the phone line? so how would calls be paid from that socket when you sign up with another company? I will have word with landlady to sort something out. Maybe pay downstairs guys to use their broadband. I not interested in landline calls. Still talk talk not disconnect phone line as it still rings. I have just sent out compaints letter to ceo department informing them I'm not liable for any costs incurred after today. Why do talk talk keep giving cancellation dates and just keep failing to cancel? I have not used their broadband as it never worked and I only use mobile so no not used none of their services. I returned their cheap router last week in the Jiffy bag posted to me by them. Horrible lot to deal with. I'm in constantly stressed. I just want them to terminate my account. They still not cancelled my account as I can get ring tones on my phone line. When are they going to disconnected me? Yesterday evening got phone call from Philippines lady and said I will be cancelled today. She said any time today. What are my options if they again fail to cancel my account? just because the line has a dial tone it doesn't mean its linked to Talk talk. Thanks for the reassuring reply. I'm worried as over the years I have built great credit score as always paid bills on time but I don't want to pay if I'm getting no broadband and that's why I cancelled within cooling off period. You are right I'm probably worrying for nowt but talk talk have horrible reputation and hate letting people of go. they cant default your credit file if you've no agreement!! Talk talk finally disconnected phone line. Just have to wait for final bill which should be zero as not used any of their services. If I have problem with final bill I'll let you know. Thanks you guys are doing terrific service against big companies. They could all become live on your bill!! !